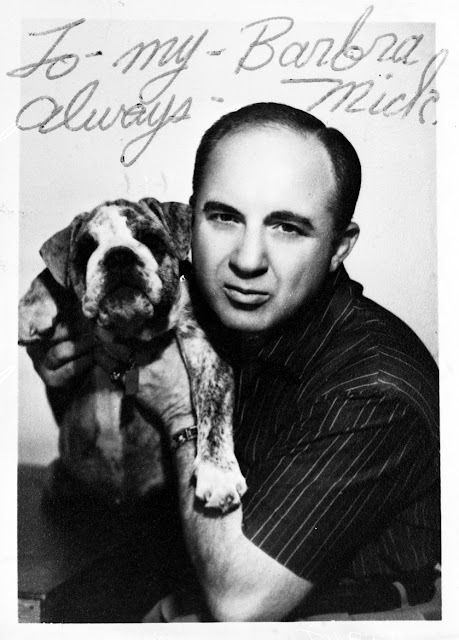 Yes, this is really a photo of Mickey Cohen, posing with a dog in a photo that he autographed for his girlfriend, Barbara. Surely, no man who loves a dog that much could be evil. Right? Based on this picture and given the choice of tangling with Cohen or Sean Penn, I think I'd pick Cohen. The dog appears to be a different one than his bulldog, Mickey Cohen Jr. I presume that the Barbara is the Barbara Darnell pictured here. You have to wonder if Barbara was to the seedier side of life as Amber and Crystal are now.